We had a nice Saturday. Ran some errands, made a chicken salad for lunch, prepared an apple crumble, and then went out to play in the snow for a while. When we came back inside, cheeks red and fingers frozen, the crumble had cooled down enough to eat but was warm enough to provide the perfect contrast to a billowing cloud of vanilla cream. Peel and core the apples. Cut into four wedges, then into 2 mm slices. Toss with the cinnamon and sugar, in a baking dish. Sprinkle the dough on top of the apples, and bake at 200 degrees for about 20-25 minutes. Let it cool a little, and eat with vanilla cream. Apple crumble really is the perfect dessert. This looks wonderful! 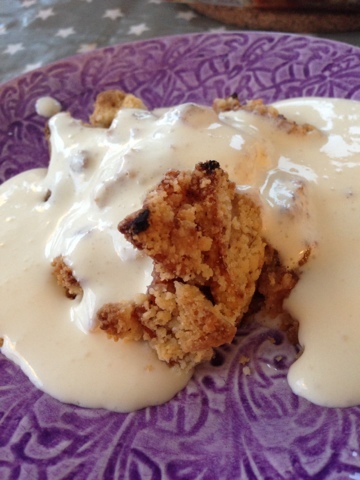 Apple crumble is my favourite winter pudding! I love it with custard too :) Your one looks delicious. I'm a sucker for anything apple! Great blog, some really interesting recipes I will give them a try. There really is nothing more delicious than an apple crumble!!!!! Looks delicious and will be trying this recipe!